Once the judge signs an order or decree that sets forth a child support obligation, the order/decree is then processed by the Clerk of the District Court. The Clerk’s office will then notify the Nebraska Child Support Payment Center (NCSPC) that a child support order has been entered. This process can sometimes takes up to two (2) weeks. Once the Nebraska Child Support Payment Center receives and processes the child support obligation, the NCSPC will assign each party (the party ordered to pay support and the party receiving support) a unique Agency-Related Person Identification Number. This is known as your ARP ID. Your ARP ID is needed to access your Nebraska Child Support Payment Center online account. To get your ARP ID number, call the Nebraska Child Support Payment Center at 877-631-9973. Withholding from Your Paycheck. 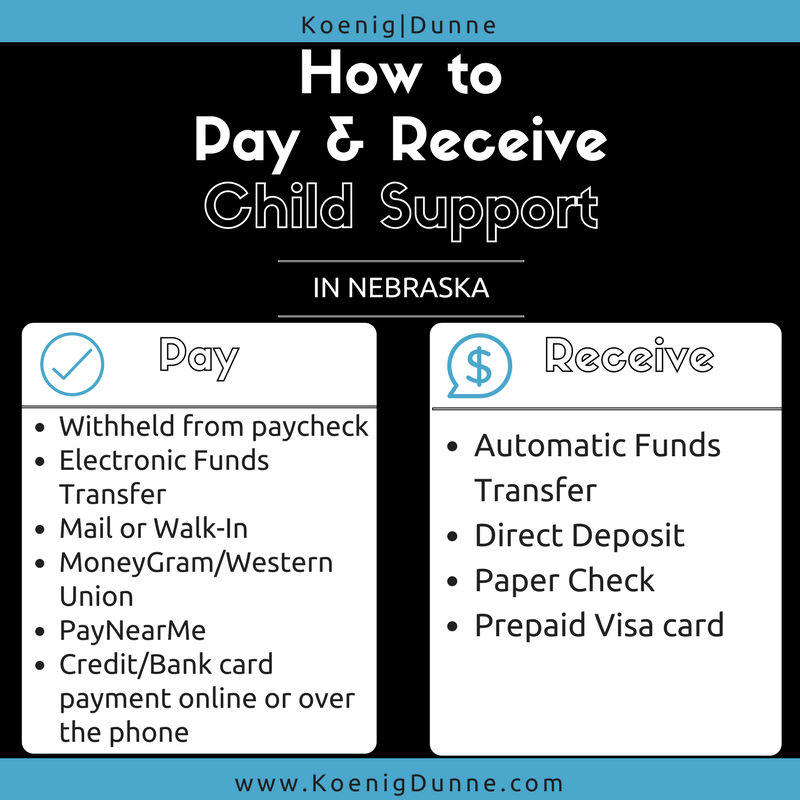 Your child support obligation can be withheld from your paycheck and your employer will forward the required payment amount to the Nebraska Child Support Payment Center. PayNearMe. Pay in cash at more than 16,000 locations nationwide and more than 50 locations in Nebraska. The fee for this service is $1.99 per transaction. MoneyGram. Pay in cash at locations such as Walmart and CVS. Western Union. Pay in cash at Western Union Agent locations, including Walgreens, Baker’s, Hy-Vee, etc. Electronic Funds Transfer. Have your child support automatically transferred from your bank account. This transfer can be set up as a single transaction or recurring payment from your bank account. Credit/Bank Card Payment Online. Pay online with a credit card or debit card. Each credit card transaction will be assessed a 2.49% surcharge fee. There is no additional surcharge for debit card transactions. Bank Card Phone Payment. Make bank card payments via the NCSPC’s automated phone system. Mail-In. Mail your payment to NCSPC at PO Box 82600, Lincoln, NE 68501-2600. Along with your actual payment, you need to download and enclose payment coupons from the Nebraska Child Support Payment Center’s website to ensure you receive proper credit for your payment. Walk-In. Submit cash or check payment at the NCSPC payment window located at 233 S. 10th Street in Lincoln, Nebraska. Automatic Funds Transfer/Direct Deposit. Your child support payment can be automatically deposited into your bank account. Paper Check. Your child support payment can be mailed to you directly from the NCSPC in the form of a check. Electronic Payment Card. Child support can be deposited onto a prepaid Visa card. This card will be issued directly to you by the NCSPC and funds will be reloaded onto the card as they are received by the NCSPC. For further information or questions, you can contact the Nebraska Child Support Payment Center online at http://childsupport.nebraska.gov or call 877-631-9973.